How to make a bow? Girls of all age loves bows whether it is for their hair or for wrapping a gift. There are many types of bows and you can buy them from the gift shop. They are made of ribbons. If you cannot find the one you are looking in a gift shop, you can make one out of your favorite colors at home. Some girls make them at home as a hobby. Some even sell homemade bows. You may be looking for a pink one with white dots. If you cannot find one like that in a shop, you can always make one using pink ribbon and white paint to make the dots. Step 1: Take a ribbon that is 3 inches wide. We are going take about 37 inches of the ribbon. Start by making a round shape which will be the core of your bow so the size depends here. Make it big or small, according to your wish. Step 2: Hold it from the back and make another round shape similar and hold them both together. Do a third one as well. Swirl them in the end. These are the loops on your bow. Step 3: Continue with the appropriate size. Make more loops. Make sets of 3 loops. Get the scissor. Step 4: Decide the size of the tail. You can take about 7 inches. Inert the pipe cleaner or wire through the center and tie it up. Make sure it is the exact color of your ribbon. Step 5: Use your scissors to cut the tail to look more beautiful. Make them like fish tails. Now, it is time to make your petals pop out and look good. Step 1: Gather everything you need and that is hair clip, strong glue, needle, threads, ribbon, safety scissors and measuring scale. Get ribbon of your desired color and cut them into 2 parts. One should be of 13 inches and the other should be of 1 inch. Step 2: Fold the ribbon around your hand make it look like a “X” in the bottom. 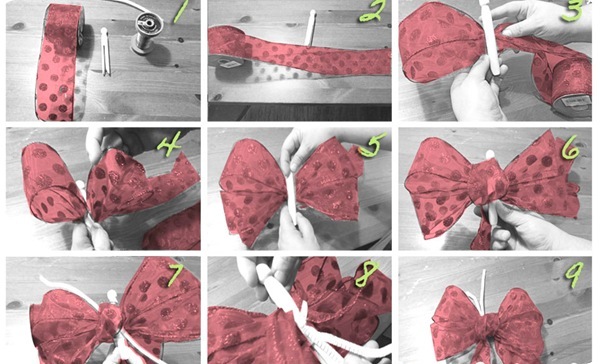 Fold it in half and sew the bow. It is incomplete without the middle. Step 3: Get the small piece of ribbon and fold in half. Wrap it around the middle and secure its positon with the glue. Use glue to attach the clip to the bow. Step 1: Take a ribbon of your desired length. Wrap it around your middle and index finger. Swirl it around your middle finger and bring it from the index finger. Step 2: Now, do the opposite and lastly, bring the ribbon from around your index finger to your middle finger. After the last swirl, tie a knot through the middle. Step 3: It would already look like a bow by now in your hand. Take it out from your fingers.